Speed Racer | Anime etc. In recent decades, Hollywood has turned out a line of effects-led blockbusters, technically groundbreaking and artistically stunted in roughly equal measure. The 1999 film The Matrix, directed by Larry and Andy Wachowski, is often seen as the peak of the form. The film’s style and substance merged in a physics-defying universe that made Keanu Reeves and his co-stars lords of space and time, levitating and rotating through time-frozen conflicts, delivering kung-fu kicks or dodging speeding bullets. For all The Matrix’s philosophical baggage, it was a joyously puerile fantasy, as the directors seem to acknowledge in their choice of material this time round. Speed Racer is a mostly-CGI simulacrum of a Saturday-morning cartoon, and the Wachowskis rarely let us forget it. The stylised kitsch images have Pop Art colours to make The Wizard of Oz (1939) look drab, the pictures overlaid in sliding or zooming collages. This techno-geek love of visual manipulation recalls 1980s pop videos and 1970s Doctor Who, whose early experiments with greenscreen led to scarily unreal images. 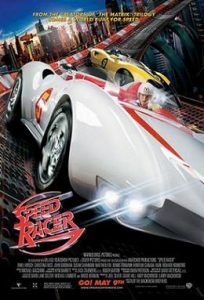 The virtual races are recognisable descendants of those in Tron (1982), but Speed Racer is really a multicoloured, family-friendly sibling of Sin City (2005), another cartoon with live actors. Speed Racer’s source TV animation was one of several early Japanese TV cartoons popular in America in the 1960s that didn’t make an impression in Britain. However, the film’s zooming action seems just as redolent of pinball machines, toy racing sets, theme parks (the racing cars spiral through rollercoaster loops and pinwheel round Waltzer-style bends), and videogames, with cross-country landscapes realised in 3D animated layers which shift and recede like quicksand. A tour of the villain’s corporate HQ becomes a parody of Disney World’s EPCOT centre, placed in a giant sci-fi megacity like the one in the Star Wars prequels, except that the space opera towers feel more real in a cartoon dream than they did in George Lucas’ humourless epic. The same goes for the film’s puppet-like characters, performed by Emile Hirsch, as the red-socked hero, with support from Christina Ricci, John Goodman and Susan Sarandon. The latter pair provides parental warmth (Goodman acted in a live-action cartoon back in 1994’s The Flintstones), but the British villains have most fun. Roger Allam is a hectoring racing tycoon, in his second Wachowski role after 2005’s V for Vendetta, while John Benfield is his piranha-owning gangster fixer. The film’s most emblematic character is Speed’s kid brother (Paulie Litt) who gobbles bright-coloured sweets without a thought for nutrition, reflecting the Wachowskis’ whole approach to this film. The problem is that the directors promise us a high-sugar feast, then let us down. The film is indulgent and bloated, losing sight of what should be its core child audience as it delivers torturously protracted homilies about malign sponsors and race-fixing while we itch to get on with the races themselves. The Wachowskis show off with non-linear montages that are sometimes confusing, including an extended back-and-forth opening passage laying out Speed’s personal and family history. It’s an artful way to evoke the never-ending story loops of a recyclable TV cartoon, but it feels indulgent in a family film. The same showiness hampers the races, which look impressive but are plagued by frenetic cutting that can push us out of the driving seat and make it impossible to follow some of the jumping, flipping, car action. As an inspiration, the Wachowskis cite a manic car chase in Hayao Miyazaki’s debut anime, The Castle of Cagliostro (1979). Miyazaki, though, was a stickler for clear anticipation and structure in his action. Nor is Speed Racer’s virtual reality watertight. One race in the middle of the film, set above Fuji, feels too near to a Sonic the Hedgehog-style game to work in the cinema, while the comic punch-ups in later scenes amount to knockabout filler. There are true thrills, as when Speed’s car zooms round hairpin mountain roads and leaps from one cliff to another, while the last Grand Prix race crescendos in a dazzling vortex of light and colour. But many of Speed Racer’s amazing images amount to brilliant advertising for a film that disappoints on its brazenly philistine terms.